First, this appears to be a clipped wing Israeli IXe. I can see what appears to be a bomb rack under the wing, as well as what appear to be rocket mounts. Yes, no, I'm crazy? Also, was there any one verson of the Spit IX that was more common in Egyptian use? I have seen both C's and E's, all with the smaller rounded rudder. Did they have any IX's with the larger, pointed rudder, or any clip winged IX's? Was any one of them more commonly seen than another? You are correct about the rocket rails and bomb racks. The bomb racks were standard on pretty much all the IAF Spit IXs. These appear to be zero length launch rails, but the also carried the Spanish/Swiss style dual rails (there are some on the current Spitfire in the IAF museum). As for Egyptian Spitfires, from a quick skim of my references, they appear to have had Vb and IXc with rounded wingtips. Others may know more info. The Egyptians seem to have had primarily IXe's with full span wing tips. There just aren't a lot of refs on them. The Ventura Publications book "Spitfire: Star of Israel" is probably the best. Both of the IX's illustrated in that book are IXe's with full span tips. My PCM kit is going to be the Israeli clipped wing E in the photo above, though I will likely leave off the rocket mounts as I want to have a chance of actually getting it finished, and I have no source for them other than scratchbuilding. I will likely do an Egyptian IXc for a little variety, and the Osprey book that I have on Arab-Israeli air wars shows one that the Israeli's captured. There are pictures of Egyptian Spitfires in an article by David Nicholle in Air Enthusiast 128/129/130. Plus Macchis, Fiats and all sorts of other goodies. Thanks, you wouldn't happen to have any copies to part with, would ya? No, I've only just indexed them. But they are only about two years old, so Key Publishing is likely to still have copies of them, as might various booksellers such as Ian Allan/Midland Counties. Issue 130 is sold out. Any chance of some scans?? This Spitfire is interesting also for me. Magazine "Wings of Fame" Vol 13 (1998) has article about Israeli AF 105 squadron and has this same photo. 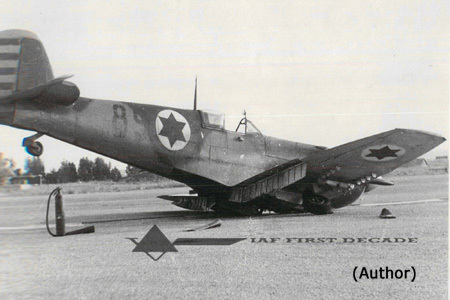 The caption says that Spitfire "89" suffered this landing accident September 3rd, 1955. I am wondering if the camo is the Israeli 50's blue/brown or the earlier RAF-like brown/green. The other Spitfire OTU squadron was amalgamated with 105th (I guess with it's Spitfires) in 1954 and this "89" could be one of them. It has the old, round rudder like the Italian-originated ones used by the other Spitfire squadron (107?). Those plane were aluminum/NMF so if this origin the "89" has got the new camo (and colours)? Anyone has good guess or definite answer? Ventura decals has sheet "Israeli Spitfires. Pt II" (V4874) and it's instruction sheet does have nice photos of the bomb racks and rocket rails. After I found the caption that it was a Spit from 1954, I decided against doing it because I wanted one that was flying against the Egyptians in '48. I thought the colors on it looked a bit like the blue/brown scheme. It could also be the grey/green scheme, though it seems a little too dark for that. It also looks like they painted over the original large Star of David then applied the smaller version. I think I can still see some of the original showing through the camo paint. If my interest in Spits holds up long enough I might decide to do it, especially if we find out the correct color scheme. "Spitfire in IAF service" shows this aircraft profile (89) as the brown/blue/grey scheme. The research has apparently been done that confirms this scheme on 105 Sqn late Spitfires. The rail shown on the Ventura instruction sheet looks a lot like the rocket rails supplied in the KP/Airfix MiG-17 kit. It appears there is a barrel sticking out of the (usually) capped outboard cannon port, even though its a C wing and shouldn't be a 50 cal. Any thoughts on what might be installed? It doesn't appear to be a second 20mm. Something the museum installed perhaps? Another .303?